“The Liberty Series” will provide a new discussion on a liberty-centric topic presented by a guest speaker. We’ll do our best to keep the time and venue consistent, but it will always be free to attend and ideally something to which you’d want to bring guests. 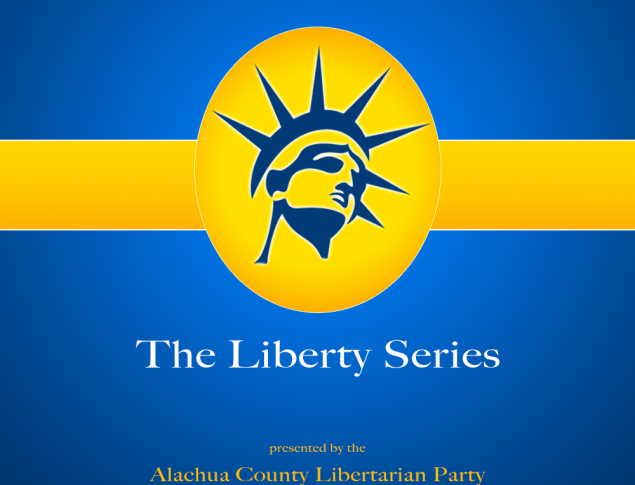 “The Liberty Series” events will begin with a few party announcements, the introduction of our speaker and topic, a 15 – 20 minute presentation followed by Q&A and discussion, closing remarks and then 10 minutes to socialize. Following the break, anyone who wishes to stay for the affiliate business meeting may do so. We’ll make a Facebook event soon, but we are ecstatic to announce that our inaugural event in July will feature Newberry Mayor Jordan Marlowe, an elected Libertarian, on the topic “Meeting Government Goals through Libertarian Principles” taking place at Crafty Bastards on NW 39th Avenue at 3 pm on July 15th. Possible future topics include cryptocurrency, entrepreneurship, current state of cannabis legalization, running for office as a Libertarian, protecting your privacy online, how to talk about liberty to non-libertarians, and much more. Some months we may even setup debates among libertarians on the subjects of being pro-life vs pro-choice, open-border vs closed-border, anarchist vs minarchist and more. If you know of anyone who would make a great future guest speaker (or debater), please contact us and let us know. We hope you are as excited by “The Liberty Series” as we are and will help to promote the events as they are announced. 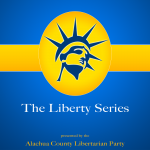 The officers of the Alachua County Libertarians appreciate your support in making these events happen and look forward to working with you in spreading liberty in our area.